Pr e s by te r i a n s To d ay | OCTOBER/NOVEMBER 2017 11 presence of the risen Christ,' " Swift said. "Our world is filled with broken and hurting people, just as it was in Jesus' day." Participating in an AoF group does not mean people have "joined the church," Swift said. "You don't even have to be Christian to partici- pate. We welcome all sojourners." Each AoF is a group of people sharing an interest or activity with approval of the session for a three- month pilot period, followed by quar- terly reviews to measure Holy Spirit indicators of energy and excitement. As long as energy and excitement are present, the AoF is continued. If there is no energy and excitement, the group is discontinued immedi- ately and its members are notified — though if there is no energy and excitement, membership typically has already dissipated or dispersed. South Church is also partner- ing with another church, New Life Presbyterian Church. New Life had nearly closed three or four times over the past two decades and had only 18 people in worship most Sundays. 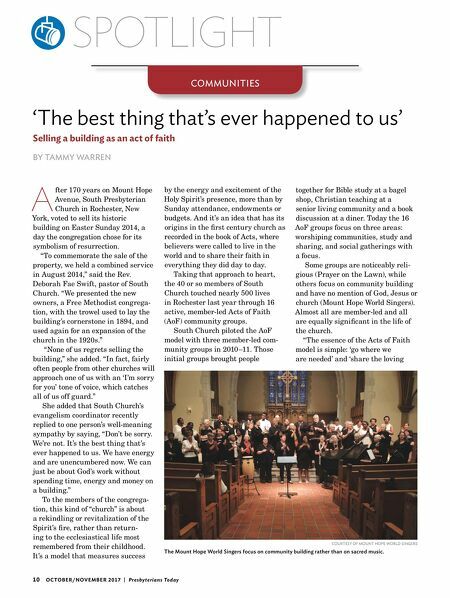 Inspired by its partnership with South Church in AoF exploration, the congregation of New Life voted unanimously to sell its 190-year-old building and create a worshiping community in a blue-collar assisted- living facility one block away. In addition to enjoying worship, the older adults are excited to host a weekly potluck and youth group activities. "Acts of Faith community groups are about worship and non-worship," Swift said. "AoFs are organic grass- roots ministries growing out of the needs of the people. The AoF model demonstrates that as we live out our faith, people will 'bump up against Jesus' through us." Tammy Warren is a communications asso- ciate for the Presbyterian Mission Agency. SEND FOR OUR FREE INFORMATION KIT & DVD 1011Military Road, P.O. Box 39, Buffalo, NY 14217; Toll Free 1-866-276-3686, e-mail: info@armento.net Visit us at www.Armento-Columbarium.com BLENDING ARTISTRY AND CRAFTSMANSHIP SINCE 1946 C O L U M B A R I U M S A Columbarium in the life of the Church preserves a tradition of remembrance. An Armento Columbarium is an affordable alternative that preserves cherished memories and delivers a message of comfort in the knowledge that those that have touched our lives will always remain in the company of family & friends. 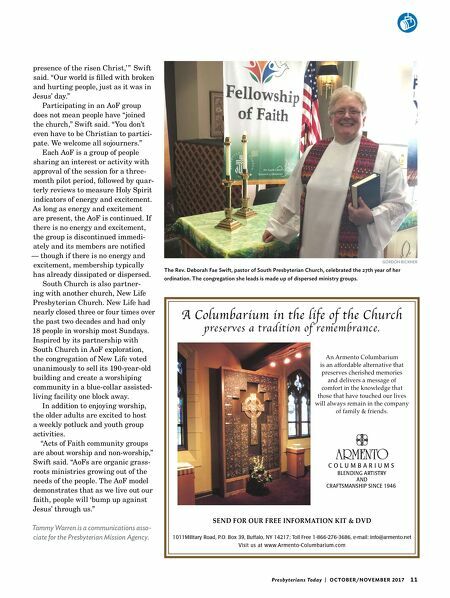 GORDON RICKNER The Rev. Deborah Fae Swift, pastor of South Presbyterian Church, celebrated the 27th year of her ordination. The congregation she leads is made up of dispersed ministry groups.